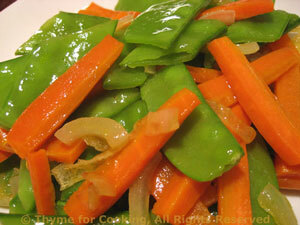 Carrots and Snow Peas, Thyme for Cooking updated Peas and Carrots. Remember canned Peas and Carrots? This isn't it.... Stir-frying is a method of cooking, not a cuisine. Nothing says we can't use maple syrup rather than soy sauce as our flavoring. Trim snow peas, cutting off the stem end. Slice diagonally into wide strips if large. Add carrot and onion; stir-fry about 5 minutes. Add snow peas and stir-fry another 3 minutes. Add maple syrup and chicken stock, reduce heat to low, cover and simmer 3 minutes. Uncover and cook off any liquid. Carrots should be just tender. Serve.